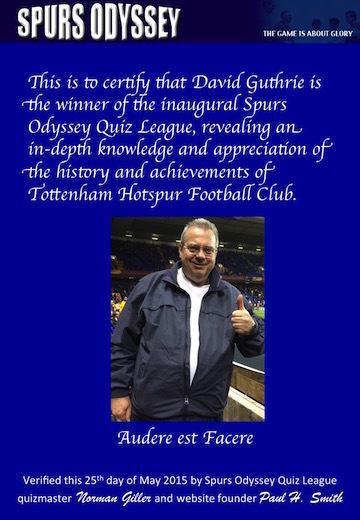 Spurs Odyssey Quiz League Champion announced! Let�s take time off from applauding that satisfying finale to the season at Goodison yesterday to celebrate the crowning of a new king of White Hart Lane. Take a bow David Guthrie, from Wokingham via Wood Green and a Tottenham disciple since the Double days. I can reveal that he is the first Spurs Odyssey Quiz League champion. David clinched the title by agreeing with my rating of the five best buys from the Gareth Bale transfer cash, plus he made it a maximum 25 points by selecting deadly finisher Sergio Aguero as the Premier League player he would have bought with the money. I plumped for Aguero ahead of the other obvious contender, Eden Hazard, because of the brutal way he has treated the Tottenham defence. Let�s have him shooting from inside the tent! We were all nearly unanimous in selecting Christian Eriksen as the best of the imports, and were in general agreement that much of the Bale money had been wasted. 1. CHRISTIAN ERIKSEN, a born organiser and in the Hoddle and Bale class for delivering free-kicks that baffle and bamboozle goalkeepers. So good that he will probably soon be nobbled a la Modric. 2. NACER CHADLI, another Belgian who improved the more responsibility he was given as a support act to �Our Harry� Kane. Produced some crucial goals as an attacking midfielder. 3. ERIK LAMELA, showing tantalising glimpses of the wonderful individual skill that made him idolised in Argentina and Italy. And we will always remember his �rabona� goal. 4. PAULINHO, another South American master who struggles to produce his best on the playing fields of England. But there have been moments when his performances have promised Brazilian sunshine. 5. ETIENNE CAPOUE, an assured midfield anchorman who gets my nod just ahead of Roberto Soldado, the master marksman who has forgotten how to find the net. Many of you came up with the same permutation as mine, but David Guthrie was one of the few who agreed with my running order. He will now be rewarded with the A4-size certificate illustrated above that will be going off for framing tomorrow. His title win is verified by me and Spurs Odyssey founder Paul H. Smith, who deserves our collective thanks for keeping us informed and interested in all things Tottenham. Our thoughts are with Jimmy and Terry as they each confront personal ordeals. Terry is halfway through a series of operations for facial skin cancer, and is somehow managing to keep the lid on the media interest in Jimmy�s condition as he fights back after his severe stroke. Latest news from Jimmy�s wife, Irene, is that he is out of the life-threatening stage and is now facing the long road to recovery. It is going to take months of physiotherapy and rehabilitation treatment and Irene asks me to pass on the gratitude of Jimmy and the Greaves family for the public support they have received during a difficult time. Just take it for sure that our old hero will battle hard to make as good a recovery as possible. There were many more who took part from all points on the compass during the 20-week run of the League, and I thank you all for your participation. Which Tottenham player scored in his only international match for England and won a League championship medal with Spurs, plus what number shirt did he usually wear throughout his playing career with the Lilywhites? You can purchase any of my books from me at www.normangillerbooks.com, including No 99 that I have written in tribute to Muhammad Ali for whom I worked as a publicist on his European fights. He needed a PR like Einstein needed a calculator. All profits from my Tottenham-themed books go to the Tottenham Tribute Trust to help any of our old heroes who have hit difficult times. I wonder what those perpetuating the daft theory that Spurs were deliberately trying to miss out on the Europa Cup have to say after yesterday�s polished and proud performance at Goodison? Tottenham played with a desire and a clinical determination to clinch that fifth place in the table, so guaranteeing not having to go through the aggravating play-off stage. Think of the 80-plus clubs that don�t make it into the Europa League. You could warm your hands on their envy. As I said last week, the tournament provides important income (nearly enough to pay Adebayor�s wages), and vital experience and action for the fringe players in the first-team squad. Plus it offers another possible route into the Champions� League. Well, Mauricio Pochettino�s Spurs could become quite something � particularly if Our Harry can keep banging in the goals next season. Let�s hope what he has achieved since November is just the foundation and not the peak of his career. Now we will settle back and see the comings and goings this summer. The ITKs have already come up with more than a dozen players Spurs may/could/will/might buy. As they were wrong with just about every one of their 64 forecasts in the season just ended, we have learned to be sceptical about their information. The one rumour I would hate to be true is that Hugo Lloris could be on the move. He has become as vital to the defence as Pat Jennings used to be in his peak years. Pochettino insists he is staying, and in Mauricio we must trust. According to my sources at Spurs the only definite transfer business settled to date is the purchase of Cologne centre-back Kevin Wimmer. He is 22, an Austrian international, powerfully built and noted for his composure under pressure. Wimmer and Vertonghen at the heart of the Tottenham defence with Boss Lloris completing the triangle. Has a nice ring, don�t you think?